Bathroom renovations and licensed plumbing services. 24 hour emergency plumbing and full service bathroom renovations. We dont do cover-ups. Your Plumber is your best choice for bathroom renovations in Windsor and Essex County Ontario. 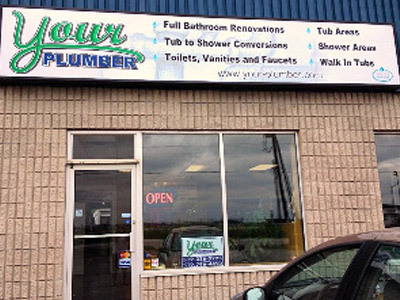 Darcy Quick has been a licensed plumber for 25 years and decided in 2010 to start his own business named Your Plumber. After opening in 2010, Quick soon heard from many of his plumbing customers that there was a need for someone to concentrate on bathroom renovations. Quick said his clients were dissatisfied with the one day cover-ups that were popular because of speed and ease. About one year after he opened, Quick decided to add to his plumbing business, offering bathroom renovations. “I hired a carpenter (Chris Hodgson) who works full time – now we offer a complete service with the renovations and plumbing” said Quick. The Your Plumber bathroom renovation showroom. A local Windsor, Essex County business Your Plumber offers a wide selection of solutions for your bathroom renovation needs including: replacement bathtubs, acrylic bath and shower systems, quality fixtures, vanities and cabinetry, and more. 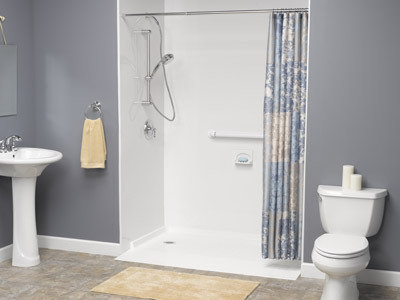 We also offer accessibility options such as tub to shower conversions, walk in bathtubs and barrier free showers. We can even convert your existing bathtub into a walk-in shower. What sets Your Plumber apart from other contractors is that company owner, Darcy Quick, prides himself in being able to start and finish a bathroom in one to two days. “Sometimes people only have one bathroom in their house – and can’t be without it. Once we start, it’s quick” he said. In addition to the Windsor showroom, Quick also works from his Leamington home. He and his wife Cindy employ four others at their business. “We give free estimates across Essex County and into Chatham” said Quick.